April 1-Oct. 31. Tuesday through Saturday 11-5. Office and library open year round by appointment. Visit the Museum of North Idaho to discover the fascinating history of the Coeur d'Alene Region. Exhibits explore steamboats, railroads, communities, recreation, Forest Service, Farragut Naval Training Station, the Ice Age Flood and Coeur d'Alene Indians. In the theatre room watch Portraits of Coeur d'Alene. Discover the people and history that make the Coeur d'Alene region what it is today. The Museum Store features local history books and gifts. A one-hour free parking voucher is available at the front desk. 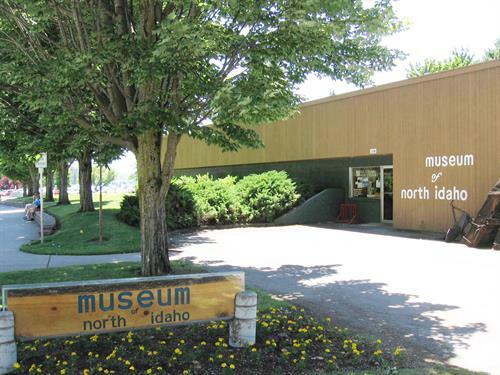 Admission to the Museum of North Idaho is $4.00 for adults, $1.00 for children 6-16, under 6 is free, and a family rate of $10.00 for two adults and children under 16. Members are admitted free. Contact the Museum for historic walking tours, special openings and group tours. The Museum of North Idaho serves as the regional repository for historical materials of Kootenai, Benewah and Shoshone counties. A research library houses archival materials, books and more than 35,000 photographs, and is available by appointment year round. The Museum of North Idaho has been collecting, preserving and interpreting the history of the Coeur d'Alene region to foster an appreciation of the area's heritage since 1968. The Museum of North Idaho Press publishes regional history books. From I-90 take the Northwest Blvd exit 11 to downtown Coeur d'Alene. Museum is located in front of the City Park at 115 NV Blvd. Free Museum parking in lot with admission.